Police officers accumulate “war stories” during their careers. At the top of the list are the memorable dog bites they’ve witnessed. When bad guys run from cops and temporarily get away, police establish a perimeter. The next call, depending upon availability, is the K9 unit. 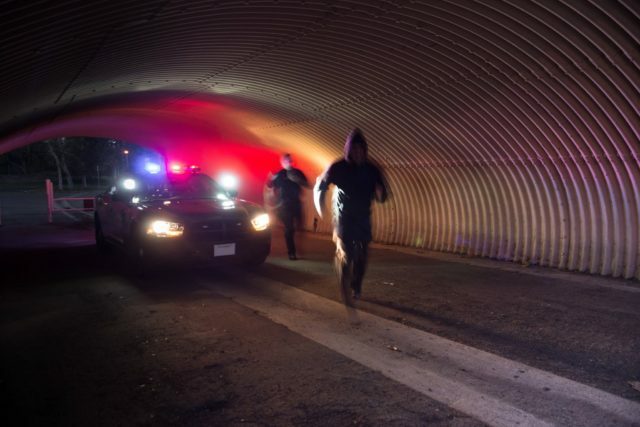 Once crooks elude police during a foot chase, they oftentimes hunker down after a few hundred yards because they’ve run out of gas—they can’t breathe, unlike TV where they seem to run forever. While they are wheezing trying to get some oxygen and remain quiet in a secreted location, it’s a relief to hear the K9 handler respond over the unit radio, “10-4, I’ll be en-route,” as the dog barks in the background. Somehow, police K9s sense when the call is for their services and they cannot wait to arrive on scene. Assuming police officers are successful establishing a perimeter before the suspect penetrates containment, chances are real good the K9 will find the knucklehead. Although handlers make required announcements when entering yards and buildings—unless the agency wants to pay large sums of money in civil suits—crooks usually test their luck and remain hidden. Yet as the handlers and police service dogs search the area, there is no mistaking the sound of our four-legged partners finding the criminal who is playing hide and seek. 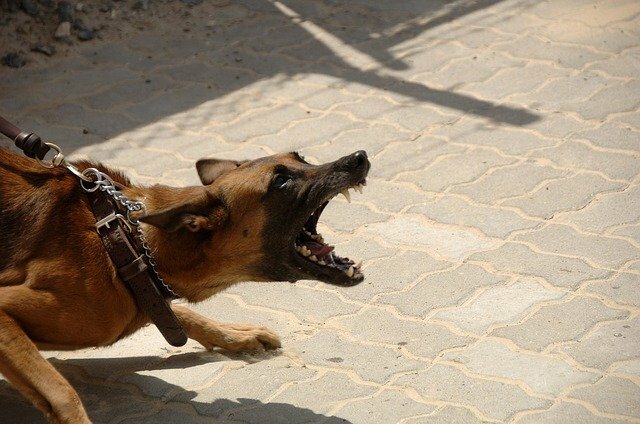 The growling snarl mixed with grunts and groans mean one thing, the dog has its canine teeth hooked onto an arm or leg. I’m going to risk sounding a bit sadistic, but this is an unmistakable joyous noise to patrol officers. We know the “gig is up”—good guys win, bad guy loses! … And it’s all because suspects refuse to surrender. … Hmmm, too bad! The perpetrator will not only go to jail for whatever the original offense was, but he’ll spend time in a hospital bed getting his wounds treated. … And I’ve seen a few emergency room nurses who’ve demonstrated less sympathy cleaning punctures wound-dog bites than a caustic schoolmarm. 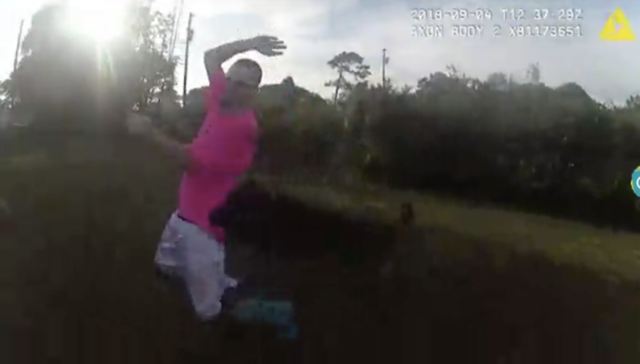 If you’re a cop, think back to the last “find”—when your K9 located a bad guy. Whether it was in the bushes, beneath a car, or tucked away in an alley, the squealing sound of surrender is music to our ears. This article would be incomplete without a true confession. 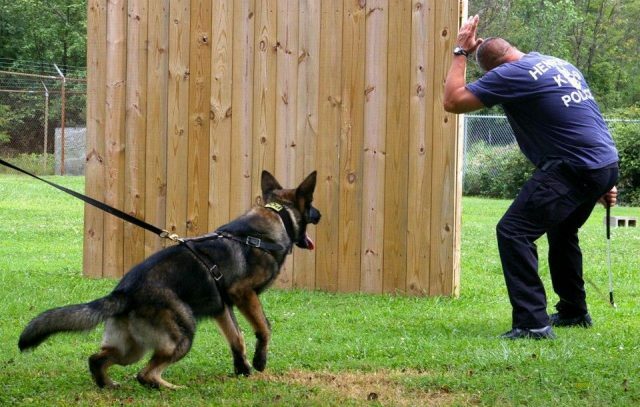 While I’ve witnessed many memorable dog bites during my career, none was as unforgettable as the time I was the one taken to the ground by a K9; not during training, but while searching for a drug trafficker. The faux pas occurred while working undercover narcotics. We lost our crook following a vehicle pursuit, yet patrol officers had the area locked down via perimeter. After searching for more than an hour, K9 Ringo decided I was the closest thing to get to a bad guy, so he launched and took me to the ground. As fate would have it, the drug trafficker was hiding in a shed on the opposite side of the fence where Ringo “apprehended” me. As a result, he scaled a tree hoping his effort would keep him safe. Ultimately, we found the bad guy and I got stitched up; no harm, no foul. When interviewing him following the arrest, I asked if he had been in the tree the entire time. If you’re not in law enforcement, yet trying to make conversation with someone who is, ask about the last dog bite they were part of. It makes for much better conversation than complaining about the “undeserved” traffic ticket you received.